The Undergraduate Theater Society is an outlet for students among the 29,000 undergraduates with a passion for theater. In their season opener they present Jennifer Haley’s Neighborhood 3: Requisition of Doom, or in the abbreviated world we inhabit—N3RD. Turn the 3 around and what do you get? The show is under the direction of Michael Joseph Hanley. Haley’s themes focus on how technology affects our human interactions. She posed in the play a series of what-ifs: What if the setting for a video game exactly reproduced the neighborhood where it is played? What if there are wormholes that allows people to glide from the game to “reality” and back? Hit the blend button and you get N3RD. The 4 member cast:Thomas Allen, Rosalind Phelps, Dominic Racelis, and Emma Broback played 16 characters! This is also about as many scene changes the run crew managed to pulloff. This play touches on the controversial issue of the level of violence in some video games. There is a warning about language, violence and the mention of drug and alcohol abuse, and addiction to video games. I had trouble tracking which family interaction a particular scene was about, but generally this is a horror play and follows the drill: there are some people (the teenagers) playing the game and thus know about wormholes, murderous zombies, and which house is the highest level and a means of escape; and then there are the clueless parents. Haley makes sure the parents stay clueless by making them all noble upholders of the domestic right of their children to privacy. They don’t enter bed rooms and would avoid reading their child’s blog if he or she wrote one. The play was fun and at times thrilling or frightening, plus it raised questions which audience members might ponder later. Scenes moved rapidly along, the set changes were well choreographed. The tech teams (lights and sound) hit their cues perfectly. Most of the costuming is what you might expect for suburban families, but there is one game figure costume near the end of the play that is just terrific. 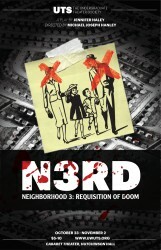 Neighborhood 3: Requisition of Doom by Jennifer Haley, directed by Michael Joseph Hanley. Suggested for ages 13 and over. Graphic violence, strong language, strobe lights & loud sounds. Run time 80 minutes with no intermission. An Undergraduate Theater Society Production. Cabaret Theater in Hutchinson Hall (on UW campus). Wed – Sun, 7:30 PM. Tickets are $5 students, $10 general, at www.uwuts.org or at the door. Closes Nov. 2.